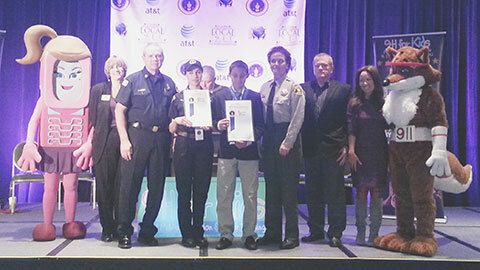 On January 23rd, 2013 13-year-old Conner Glasser was awarded during the CalNENA Conference in San Diego at the AT&T 9-1-1 Heroes Award Ceremony, as a 9-1-1 youth hero for savng his mother's life. After falling and injuring her head, Conner immediately dialed 9-1-1 and followed correct 9-1-1 dialing procedures. He calmly spoke to dispatcher Nancy Duran, giving his correct address and following her instructions to care for his mother until help came. Fire Chief Javier Mainar, Captain Sherri Sarro from San Diego Sheriff's, CBS News reporter Angie Lee, and president Cheri Lynn Rockwell of CalNENA were all present to acknowledge and award young Conner Glasser for his bravery, along with dispatcher Nancy Duran for processing the call and dispatching the appropriate emergency response.